Apr 5-7 Southwest China Hash Hosted by the Chengdu Panda H3 in Chengdu, Sichuan, China. Apr 12-14 Belgian Nash Hash Hosted by the Brussels Manneke Piss H3 in Voeren, Belgium. Apr 12-14 18th Green Jacket Campout Hosted by the Peach Fuzz H3 in Augusta, GA, USA. Apr 12-14 10th Annual Venice Kilt Hash Hosted by the H3 in Venice Mestre, Italy. Apr 12-14 Hangover Weekend Hosted by the Hangover H3 in Virginia Beach, VA, USA. Apr 19-21 Texas Interhash Hosted by the Brass Monkey H3 in Dayton, TX, USA. Apr 19-21 Ginnie Springs Hosted by the Camp Bacon H3 near High Springs, FL, USA. Apr 26-28 800th Run Hosted by the Mauritius H3 in Pereybere, Mauritius. Apr 26-28 Camp Whore Island Hosted by the Tallahassee & Area H3 in Quincy, FL, USA. Apr 26-28 Campout Hosted by the Chattahoochee Valley H3 near Fort Mitchell, AL, USA. 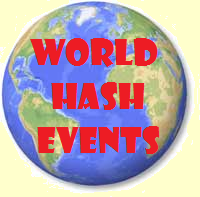 Apr 26-28 Fest Hash Hosted by the Stuttgart H3 in Stuttgart, Germany.